This gives you a sampler of different kinds of specialised contact treatments. 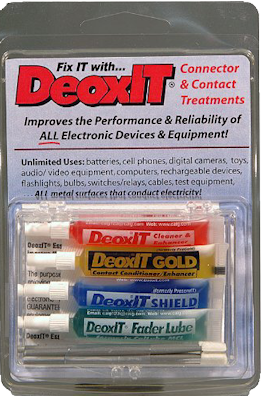 Use DeoxIT D100 for overall cleaning, Gold for gold plated contacts, Shield (blue) to coat non-gold cleaned contacts against further oxidation and Fader for carbon based controls, such as slide controls or carbon pots, or connectors on plastic multiconnects as found in cellphones. Amazon database says it does not have it is stock, but the website says it does.